Hi everyone! 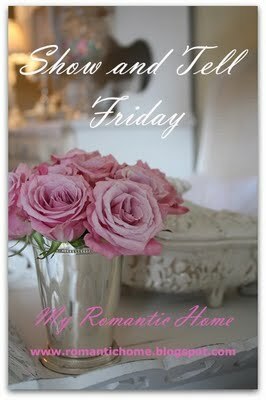 Today is Show and Tell over at Cindy's Blog My Romantic Home. Go and check out all the fun show and Tell things folks are posting about today! Also, don't forget, today is the last day to sign up for my giveaway. Just click on the pretty blue and white cke plate on my sidebar to sign up! A couple of weeks ago I got some pretty little thrifty finds at T J Maxx. I thought I would share them with you today. 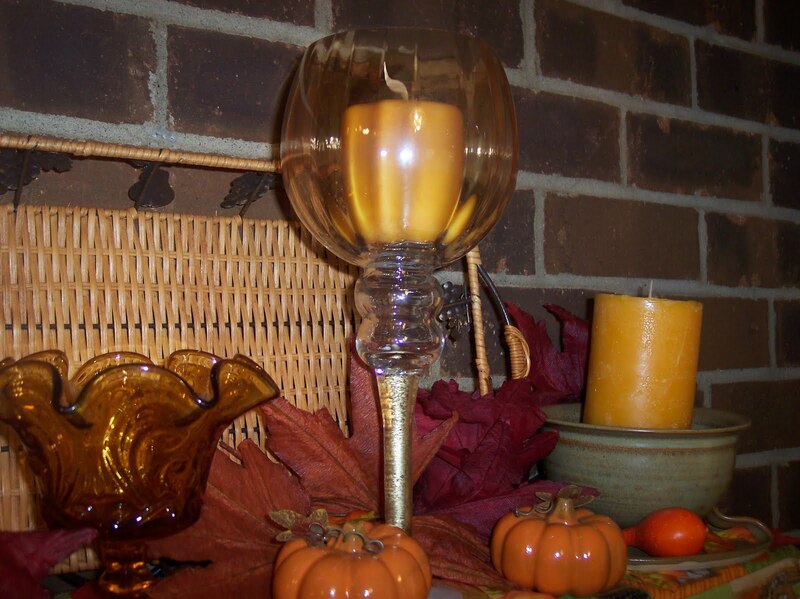 This first one is a beautiful tall candleholder goblet. I love the light colored amber in the globe. The stem has gold glitter inside the glass. So pretty and sparkley! It is about 12" tall. It was $2.99. I know y'all have seen this faux aged mercury glass look eveywhere. It's so pretty. But, this candle holder just leaped into my basket while I was walking around the store...honest! Don't you just love the little bling on it! Sparkle, sparkle, sparkle! Oooh, so lovely lit up! It was only $1.99! I went back this week to pick up another one and I got the last one. It is in pink! Love it. 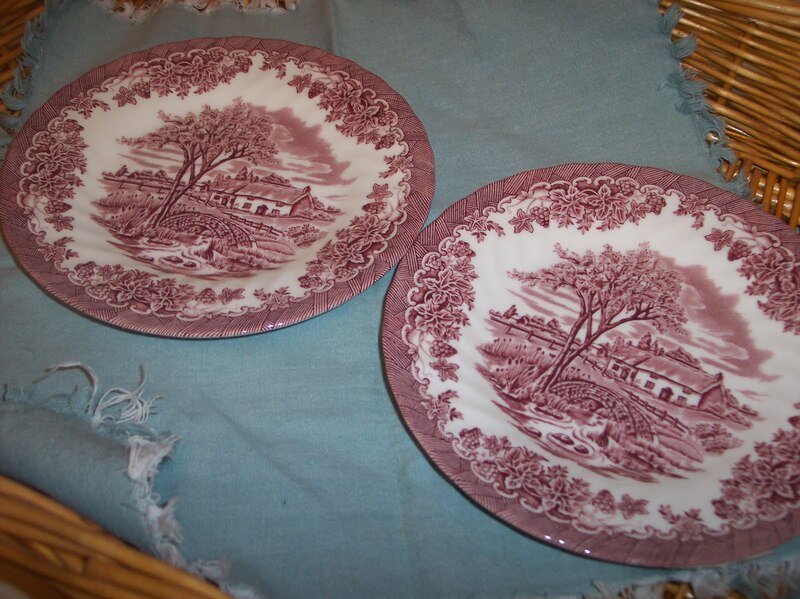 These two red and white transferware dessert plates are just so pretty! They were both $1.00! I am also linkin up with a blog that is new to me but, it's just fabulous! It's called "Finding Fabulous!" and on Fridays is FrugaliciousFriday. Stop by there and say hi!! great finds you got here! love the transferware dishes! lovely! thanks for sharing..
Great finds but really love the candle holder. 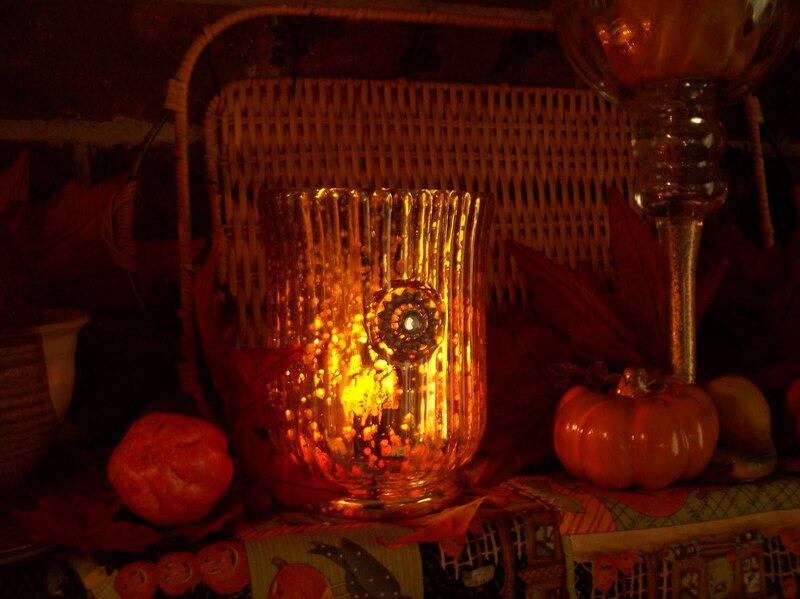 I so love the warm golden glow the candles have...beautiful!!! Love the soft glow from the candle through the glass and who wouldn't love those red plates! Yum!! That's my kind of shopping spree! You got some great things even for TJ Maxx! 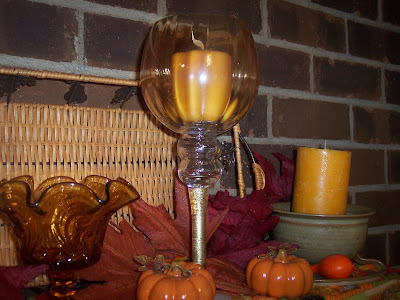 Love the candleholders ~ those colors go with some glasses and little custard dishes I got. Oh...I love the red and white transferware plates you found. Those will be perfect to display at Christmas! You got some great deals. I almost bought some candle holders similar to those. Thanks for sharing. So lovely lit up. I'll have to check out our store. Also...thanks for coming by and taking a peek at my Seasonal Snippets! I always really enjoy your visits, my friend!!! Great deals and how very pretty. 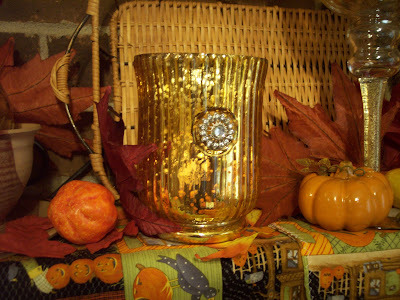 I love the votive candle holder with the "Bling, bling." A girl can never have too much of that...right? :-) Thank you so much for sharing. Hope you are having a great day. So pretty! But I LOVE your red plates; I'm so into red transferware! Thanks for sharing and have a wonderful weekend. GREAT finds! I love the color of amber in home decor. Wow, some fabulous finds....especially love the transferware as I'm beginning to collect older pieces. The red and white plates remind me of my grandma's green and white plates she used when I was growing up. They are actually still in use at her house. They are the main dishes I remember always using, and then there is one that she pulled out at the holidays with a flower pattern. Diann, you did so well! Amazing that you got all of that for such a super price! Love the plates and the holder. Don't you just love a good deal??? I laughed out loud when I read about the chocolate eclair car. I might fight you for that one! LOL! Ack...what fabulous finds you found! You totally scored! Thanks for linkin' up to Frugalicious Friday!